Your child comes home from school with an assignment that stresses you out. He has to make a diorama from a shoebox that depicts a rain forest. It may sound difficult, but it doesn't have to be. A simple but fun and creative diorama can be made with just a few purchased items from the craft store and a little bit of time and patience. Make it fun and talk about the animals of the rain forest with your child. Create the sky and the water first. Cut some blue construction paper to make the sky and tape it into the top part of the shoebox. 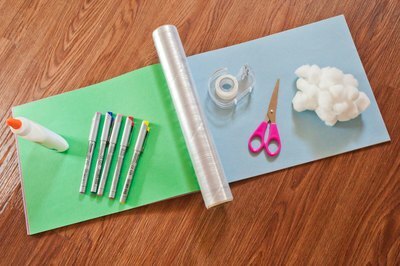 Glue cotton balls onto the blue paper to make it look more like a sky. 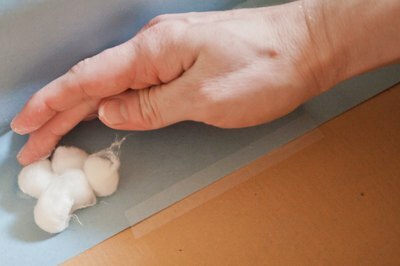 For the water, use a darker shade of blue paper and glue it into the bottom half of the shoebox. 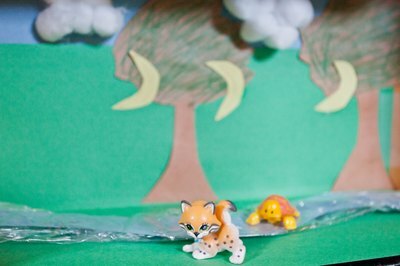 To create a water effect, lay down a sheet of shiny plastic wrap in the bottom of the diorama. Make your water as big as you like, but leave some room for animals and vegetation. Blue plastic wrap can be purchased or you can use clear. Add trees. 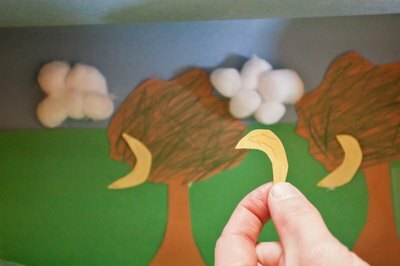 These can be plastic trees or you can make trees from construction paper. Put in a lot of trees surrounding the water. Rain forests are lush, dense environments full of plant and tree life. Some trees grow fruit, such as coconuts and bananas. Have your child make some of these fruits out of the appropriately colored construction paper and tape them onto the trees. Trees can be different sizes, but most of the trees in the rain forest are tall. Put in the animals. Purchase plastic animals at a craft or hobby shop, but if the animals you want aren't represented, make them out of construction paper and glue them in. If you can glue in your plastic animals, do that. If not, set them carefully in the diorama or tape them in if that can be done. Some examples of animals that inhabit the rain forest are toucans, butterflies, snakes, tigers, monkeys, sloths, iguanas, frogs and alligators. Place animals at different levels of the diorama, such as birds in the sky, sloths hanging from trees and crocodiles next to water. This is how a real rain forest works. Jazz up the diorama if you like. Dot some glue on to your trees or ground and sprinkle turf shaker onto them to create a more lifelike look to the leaves. Add white glitter to clouds or blue glitter to the water or sky.